Don't stress looking for a Web Designer! I build customer-first experiences using market research, consistent Branding and Web Design best practices. I'll take care of your Web Design & Logo Design so you can get back to shipping product. 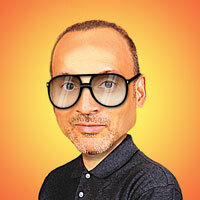 I'm Dave, a front-end Website developer, graphic artist and collateral designer. I help small business owners with tiny to ginormous, usually time-compressed graphic design, print and Web Design projects. Basically I help them improve their marketability and customer reach. All the heavy lifting of designing and coding a Website into a really effective marketing tool happens here. Your new Website becomes an online billboard that lets everyone know about your services & products all day, every day. Typical turnaround: 15-business days, includes Domain Registration and Web Hosting assistance. There's no Frankenstein1 clip-art-ing here. My Logo Design projects start with an idea and end with a product guaranteed to stand out on Websites, business cards, product labels, even apparel. Typical turnaround: 3-business days, includes project files and Logo Copyright Release. 1 "Frankenstein" clip-art-ing: combining elements from other (people's) designs, then selling it to a client as original or unique. Typical turnaround: 10-business days to print and deliver.